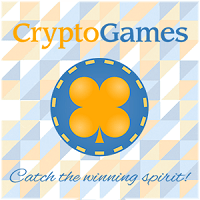 Crypto-Games houses a dice, slot, roulette, video poker and software blackjack platform with competitive odds, support for a strong range of crypto currencies and even jackpots for dice players. The option to invest in the house bankroll is available for the currency of your choice and the entire operation is founded on provably fair algorithms and displays bets on a public ledger for all players to witness. While the interface is not as flashy as other sites, it is fully functional and has a built in chat system to talk with other players. Dice gaming provides a full array of betting options to modify your bet amounts if playing on auto If you are making your first foray into the world of crypto currency gambling, Crypto-Games.net is a wonderful place to start. Our biggest gripe is that the color scheme is very bland using grey and black. This isn’t exactly the most attractive site on the internet for dice, slots and blackjack but it does get the job done. Navigation of the site is straight forward and there’s even a chat box to talk to other players. Just remember to tone down the language as you can be banned for profanity and other unnecessary things. There is an option to view your personal statistics as well as global statistics which is a great feature not found on other dice sites. You can also view statistics on the top players including most wagered, most bids, most tips, most chat messages and so on. Like all legitimate dice sites, Crypto-Games displays its seeds publically for the world to see. By entering the server and client seeds into a generator and converting the first few digits into decimal, you can prove the fairness which gives members the peace of mind they need to verify fairness on both sides of the fence. 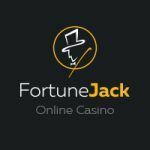 Since the site has dice, slots, roulette, video poker and blackjack, you can actually verify the fairness for all four games. 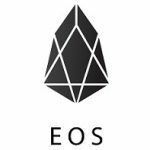 Being able to do this is the industry standard and Crypto-Games has ensured they are providing a solid environment for Bitcoin and other crypto currency gaming. *Since you have a 49.7% chance of winning the slots game in combination with the 1.97% house edge, the house only pays out 98.03% of your winnings. As you can see, the house edge is very fair for players, more so than real casinos in relation to slots and blackjack. Since these house edges are quite fair in favor of the player, Crypto-Games is a great place to gamble your crypto currencies on based on this premise alone. 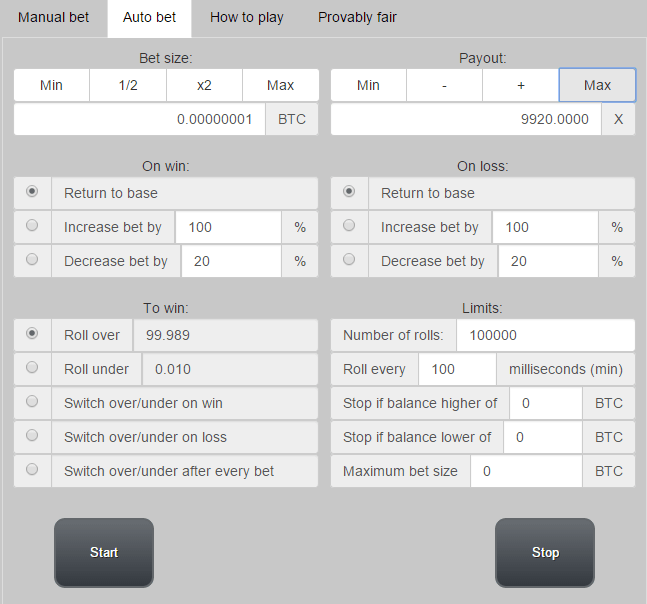 All traditional dice sites let player set up automatic bets for their dice. Players can adjust many factors when betting on auto mode. You can adjust your payout from the standard 2x up to 9,920x but this comes at the price of sacrificing your probability of winning. Fully customized auto bets will allow players to customize their bets based on options in the chart below. As you can see, the betting system gives you full customization of your betting patterns as you win and lose. This is advantageous for advanced users who don’t believe in gamblers fallacy. The site makes no mention of using bots whatsoever so it is presumed they are permitted if you wish to use one. However, take the risk at your own caution. We are no responsible if you are banned for using a bot. Crypto-Games provides a faucet for players once every 3 minutes from a single IP address. You can request 0.00001 BTC to play with. You can actually increase your faucet bonus depending on how many messages you’ve left in chat, how many players you’ve referred to the site, loyalty (calculated in days), invested BTC and wagered funds. Each level you obtain increases the amount you receive for each faucet request as well as how many times a day you can request funds from the faucet. This is very competitive in comparison to other top tier dice sites and keeps players on the site for longer. Interestingly enough there is a jackpot to be won if your roll is 7.777 or 77,777, your roll is a winning roll and if the last two digits of your dice bet ID are 77. You can only win 100% of the jackpot of your bet amount is 0.005 BTC or more. 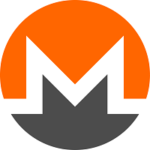 You will lose a chunk of the jackpot in proportion to far below 0.005 BTC you bet. So if you bet 0.0025 BTC, you would get 50% of the jackpot. 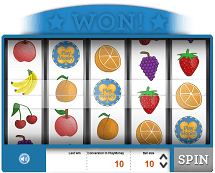 The jackpot currently sits at $660 USD which is a decent amount although the odds of hitting is are quite low. The blackjack is software based with a max bet of 100,000 credits which is the equivalent of 0.5 BTC. Again, the blackjack is not a great way to gamble but certainly an excellent way to have fun while you let your auto bets roll in the background. Site is offering european roulette with single zero and 2.7% house edge. Maximum win on single field is limited to 0.5 BTC and nice how to play instructions for beginners. As all games at crypto-games.net, roulette is provably fair also with instructions how players can verify their bets. 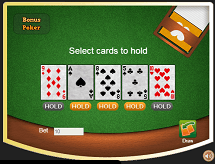 You can play three variants of poker (Jacks or better, Tens or better and Bonus poker). After confirming your wager amount, press Deal and you will be dealt five cards. You will then have the possibility to hold any combination, all, or none of the 5 cards you were given. Once done, click Deal button again to finish the hand. 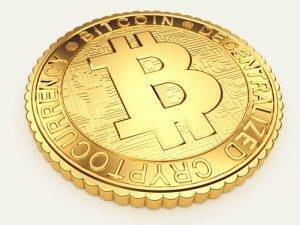 Win up to 12 Bitcoin with one bet hitting Royal Flush! If it’s your first time gambling with crypto currencies then Crypto-Games is a great place to play. The site may not look spectacular but is provably fair and fully functional with a large community you can communicate with through the chat box. With full support for auto betting and slew of options to vary your betting ranges players can have a great time playing on the site even if they’re having a few spins on the slots game or hands of blackjack. Crypto-Games is by no means one of the big name casinos we are used to reviewing but it still has its own special charm. 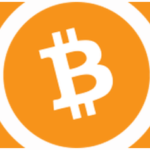 We recommend visiting the site if you are looking for non-complex gaming or are new to the Bitcoin scene. You can be guaranteed to have some fun while also learning how to gamble with Bitcoins. Cinco de Mayo at BetChain bitcoin casino! Where is the faucet button? I have had good experiences here and find it to be amongst the most fair cryptocoin dice out there. Plinko and Minesweeper are also added, along with more coins. Great site and still one of the most fair casinos around.